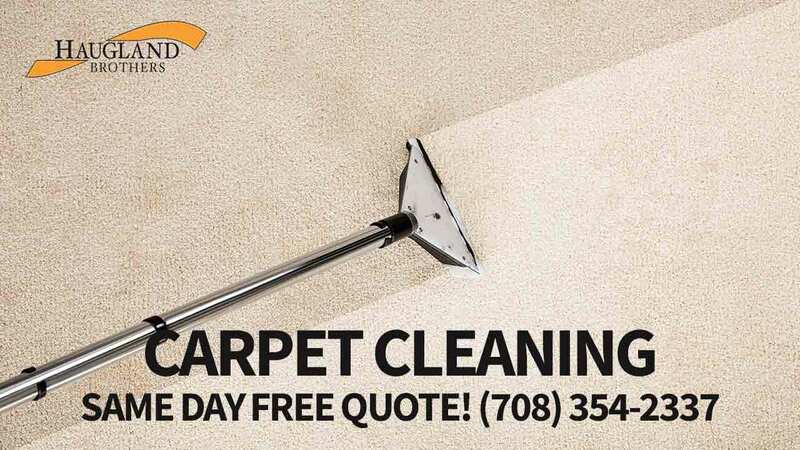 Call (708) 354-2337 :: Proudly Serving Hinsdale, Western Springs, IL & Surrounding Chicago Suburbs Since 1958. Haugland Brothers Carpet & Floor Care is an on-site professional cleaner of wall to wall carpeting and area rugs in Chicago homes and offices. No project is too big or small for our team of dedicated carpet cleaning experts! Give us a call today and schedule your on-site carpet cleaning! Our professional carpet cleaning services are offered at competitive rates that our competitors just can’t beat. Wall to wall carpets and area rugs are a big investment. They also make a first impression on your home or business. If you want to ensure that your carpets last for as many years as possible, and consistently look fresh and clean, they need to be professionally cleaned on a regular basis by a team of experts. When you are actually able to see how dirty your carpet is, the damage has already begun. Particles are already at work breaking down the fibers and ruining the appearance of your carpet. By having your carpets cleaned before they get to that point, you are prolonging the life of your flooring and protecting your investment. Carpet cleaning should be conducted at least twice a year. Especially after the winter, where sand and salt are often traipsed through homes and offices from the Hinsdale streets. Higher traffic areas and offices generally require more frequent cleaning. Although dirt may not be visible in darker colored carpet, it is still there. Frequent cleaning should still be conducted on a regular basis. What Can You Do to Protect Carpeting Between Cleanings? If you vacuum regularly you will be able to remove some of the dirt and contaminates yourself in between cleanings. You should also ask your professional carpet cleaners about applying carpet protection after a cleaning. By having carpet protection added to your regular cleanings, you are giving it that extra strength it needs to preserve its beautiful look and feel. How Important is Carpet Protection? Very important! Carpet protection will reduce the possibility of permanent stains and make spot cleaning easier. Traffic lanes are avoided and the life of your carpet is extended. Do not underestimate the benefits that the extra step of having a carpet protection applied will give you and your carpet. Don’t Take Another Step on a Dirty Carpet! Call Haugland Brothers Carpet & Floor Care Today and Schedule A Professional Carpet Cleaning That Will Restore Shine and Luster to Your Carpets! Haugland Brothers Carpet & Floor Care provides high quality carpet and rug cleaning services to Hinsdale and surrounding areas. We are proud to share our carpet cleaning expertise with a number of Chicago communities. Using our years of experience in the industry, we will make your home or business more inviting by maintaining the clean environment that you love. Haugland Brothers offers a full line of floor cleaning services to meet any need and allows you to choose the services you want, mixing and matching as you desire to achieve your desired results. Wall to Wall Cleanliness in Your Carpet! Haugland Brothers brings to your home or business state of the art cleaning equipment and the latest products and techniques to make your wall to wall carpeting spotless. The entire process, from is handled with the utmost level of professionalism and efficiency. You will find it to be of no inconvenience to you as our group of experts brings new levels of shine to your carpet. Our company has the skills needed to take care of your area rugs with the same professionalism as your carpets. Our top of the line cleaning equipment is fully capable of taking care of large room sized rugs and smaller area pieces. We can also provide specialty services for those precious Oriental or heirloom rugs that make your Hinsdale home or office stand out. With Haugland, they get the extra care that they deserve combined with the thorough cleaning they need.